Demonstrations against a potential war on Syria will be held on Saturday, August 31 in cities throughout the US and the world. President Obama threatened a military strike on Syria in response to Assad’s alleged use of chemical weapons. The ANSWER coalition is also calling for demonstrations in a number of cities in Northern California. In Los Angeles, there has been a call for 2pm in Pershing Square. In San Diego, a rally will be held at noon in front of the Fleet Science Center. SAN FRANCISCO, California – On Thursday evening, a number of organizers from the recently evicted squat, SF Commune, were beaten and arrested by city police at San Francisco State University. The organizers were visiting friends living in the dormitories at the university when they were later arrested and charged with a number of offenses including, trespassing, battery, lynching, and conspiracy. Following the arrests, the arrestees required medical treatment at a hospital. Although local news reported that an officer was injured during the incident, friends of the arrestees stated, “[from] the information we [sic] gathered after speaking to the police, the officer suffered from heart palpitations and didn’t receive any direct physical injuries from the individuals involved.” Reportedly, the police officers involved in arresting the organizers also participated in the eviction of the squat earlier that week. A rally is being organized to respond to the police beating: it’s scheduled for Tuesday at 2pm in the Malcolm X Plaza on the SFSU campus. For more information about the event, visit indybay. Students at SF State are holding a march and demonstration against SF State police brutality, today at 2pm at Malcolm X plaza in response to violent actions by campus police there, Thursday evening. Seven San Francisco activists were brutally attacked by police and arrested Thursday evening after being invited into the SF State University dorms by students there. Several police officers were harassing a few of the individuals outside of the dorms when they chose to practice their constitutional rights by walking away. The officers followed them into the building and continued to harass them until an altercation occurred when an officer tried to grab and push one of the people involved. The police used unnecessary force in restraining the individuals and several of those involved were sent to the hospital after having sustained injuries. One individual was tazed and another was reportedly shoved into a paddy wagon where police continued to viciously beat him. There is video of the incident circulating on the internet, but much of the brutality wasn’t captured on tape. The mainstream media is spreading misinformation about the incident. They are claiming that the individuals were “unauthorized” in the dorms, even though they were invited to [sic] there by students and SFSU housing guidelines clearly permit guests. The media also highlights the fact that an officer was injured. From the information we gathered after speaking to the police, the officer suffered from heart palpitations and didn’t receive any direct physical injuries from the individuals involved. The activists were residents of the SF Commune, an abandoned building that protesters occupied and transformed into a social center and housing for the neighborhood since April of last year. The activists, who cleaned the dilapidated building, made it habitable for the first time in years and planted a blooming garden in the backyard, were welcomed by much of the community for their efforts. The building, on 200 Broad St in the Ocean View neighborhood, was raided by dozens of riot-clad SFPD Wednesday morning, about 36 hours before the incident at SF State; 28 residents were forcibly removed and briefly detained, while three were arrested. Students and activists are holding the demonstration to call for an end to campus police brutality and harassment of students and visitors. Meet on SF State campus at Malcolm X plaza at 2pm today, Friday May 17. UPDATE: Demonstrators gathered for a rally on Friday afternoon, transitioning into a march to an administrative building. The demonstrators spoke with the Vice-President and the Dean of Students. All over the world, left-wing and anarchist activists are facing ever-growing repression from the capitalist state and its agents: the police. 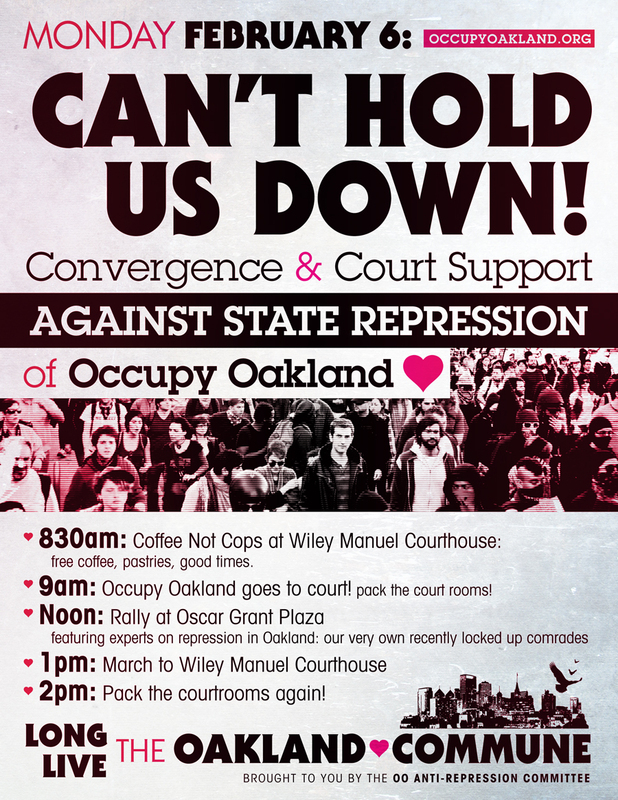 In the bay, we face our own struggles as our self-organized spaces are evicted, and our comrades are dragged through the legal system and put behind bars. We must stand strong in the face of the enemy. Come pack the courtroom on February 8th to support the ACAC 19! Solidarity is our weapon against the state! Our love for our comrades is stronger than their cages and their courts! The California Department of Corrections and Rehabilitation (CDCR) is converting Valley State Prison for Women into a men’s prison in response to a U.S. Supreme Court order to reduce overcrowding. Instead of releasing people, they are squeezing over 1,000 women and transgender people into the two remaining women’s prisons. This has aggravated overcrowding (bringing Central California Women’s Facility’s population dangerously close to 4000), created dangerous conditions and health care is getting much worse. What’s more, they have added yet another men’s prison to their inhumane system. Read more. Rally in Support of the Prisoners on Saturday, 26 January at 3pm in front of the Valley State Prison for Women, Chowchilla, California. RSVP on Facebook. Carpools are leaving from Oakland and Inglewood. On Saturday, a march in San Francisco against Colonialism and Capitalism resulted in 20 arrests. Police had a significant presence early on, and forced a confrontation, in turn demonstrators threw a few paint filled balloons at officers and at an ATM machine. A police officer then rammed his bicycle into a crowd member, launching a wave of riot police at demonstrators. Police wielding batons, indiscriminately pushed & struck anyone in the area. All of the demonstrators who were arrested are facing 5 or 6 charges, including inciting a riot, conspiracy to commit a crime, obstructing a peace officer, failure to disperse, and what appears to be some variant of jay walking. Some charges have been dropped and others reduced; most arrestees face 3 misdemeanors each. Trial has been set for November 9th. The legal support fund for the Anti-Columbus arrestees. 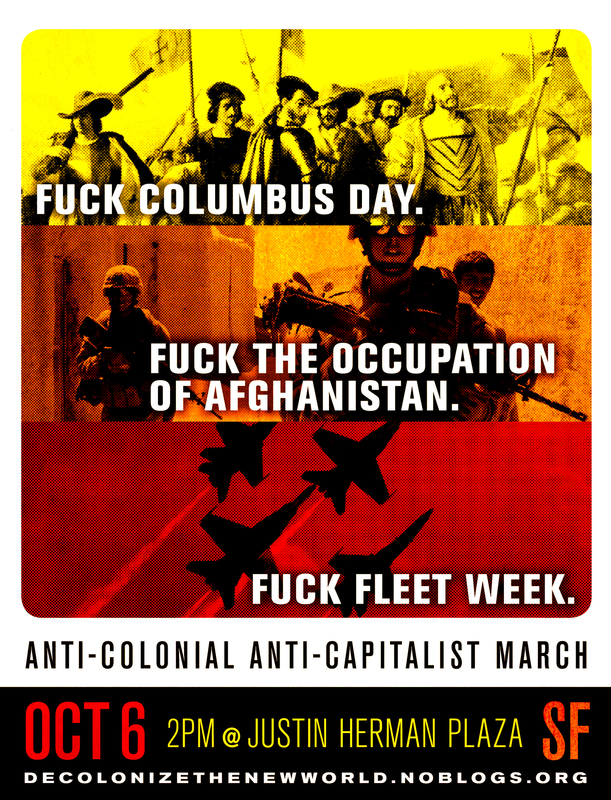 Columbus Day 2012 marks the 520 year anniversary of the genocidal and ecocidal project of Empire building and colonial expansion that began with the conquistador invasion of this continent and continues to this day through the daily violence and exploitation of global capitalism. The DavisDozen are a group of students and a professor given conspiracy charges for holding a sit-in in front of a campus bank branch of the US Bank. The demonstrations eventually lead to a decision by the bank to close its doors. 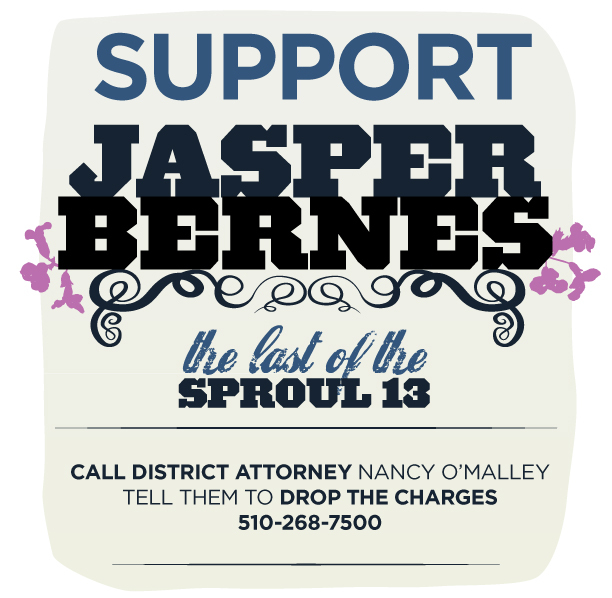 Their next court date is another pre-trial on June 22, 1:30pm @ Yolo County Courthouse. Read this report on the June 1st court date. The Santa Cruz Eleven are a group of demonstrators arbitrarily charged with the take over of a vacant bank in downtown Santa Cruz. The hefty charges include felony vandalism, and a handful of other misdemeanors. Updates on SantaCruzEleven here. As of June 11, all 9 of the people charged for trespassing at the Gil Tract Farm in Albany have been dropped. Read more. Demonstrators who helped shutdown the US Bank at the UC Davis campus have been handed criminal charges. A rally is being held this Thursday, April 5th at 2pm at the M.U. Patio in support. SANTA CRUZ, California – A week ago, 11 people were arrested over the occupation of the former bank on 75 River st. on 30 November 2011. The occupation was intended to turn the space into a community center hosting a slew of services the city didn’t offer. More people may still be arrested according to mainstream news sources. Charges include a variety of felonies and misdemeanors. There will be a solidarity demonstration today, Wednesday 15 February, at 3pm on 74 River st. in front of the Wells Fargo branch. CALIFORNIA – Statewide demonstrations for March 1st-5th are being organized at all levels of public education over unending budget cuts and austerity measures. Demonstrations are planned for individual school campuses on March 1st. Students at UC Santa Cruz have already announced plans to hold a strike. 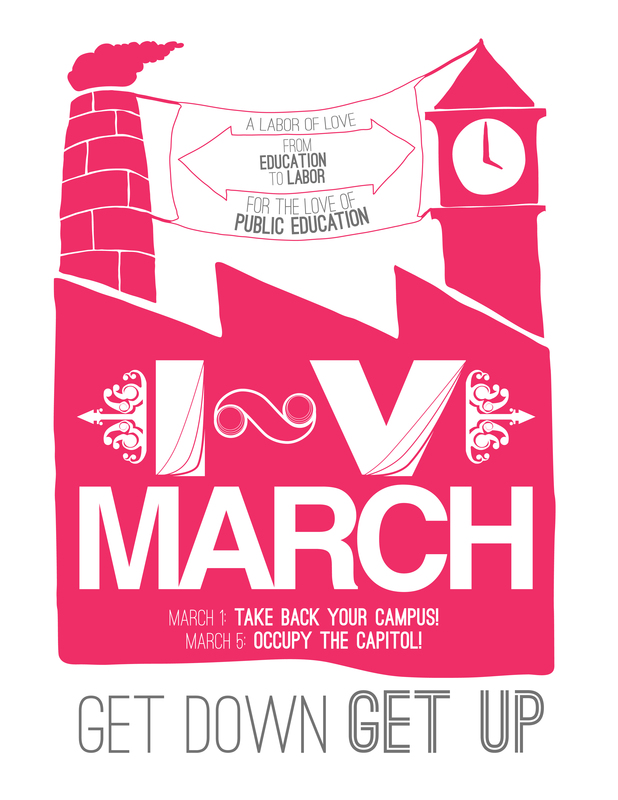 Efforts are being made to “occupy the capitol” on March 5th. Have photos, news, or other content on direct actions? Post a comment on "Submit Content" listed below with it! See 'Annotated Links' for an expansive and exhaustive list of links.